Note: this is part three of a five part series of articles - subscribe to our newsletter, follow us on Facebook, Twitter, and Google+, or contact us to receive instant notice on future articles or learn more. If security and compliance establishes a solid foundation for the ongoing risk management involved in oral healthcare, then integration is the key to a profitable dental practice. In the IT industry, every expert knows that complete integration will save on cost, and make the system more efficient and effective. This doesn't mean a lower cost system. Instead, the term often used is "Total Cost of Ownership." The process of purchasing and implementing ClearDent is almost always higher in terms of dollar amount when compared to lesser systems; but we ensure that a) all pricing is disclosed upfront with no hidden fees, and b) you get more actual value and long term dollar savings using ClearDent over the competition. “ClearDent seamlessly integrated with every digital camera and x-ray device in our office. The set-up was quick and easy, and with ClearDent managing our digital imaging and our digital patient files, we have improved our level of client care and our bottom-line. Before turning to ClearDent, our office juggled a number of software programs designed for different areas our dental practice. And when support problems inevitably arose, we ended up juggling shoddy services and costly support bills from a handful of different vendors. Many dental professionals often have to pay multiple support fees for multiple systems, and train staff on multiple systems. The costs of all of these multiple fees adds up over time. With ClearDent, everything is all-in-one. 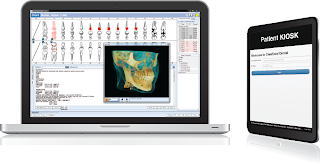 You don't need separate software for Digital Imaging, Electronic Charting, and Patient Communication. Further, we're a forward looking software developer where we offer mobile solutions, such as our Patient KIOSK so you don't yet need another software just to electronically capture a patient's medical history. Plus, it's done on Tablets, which is what most patients are familiar with.